Whenever I see a bottle of German bier here in the States that features citrus-tasting hops or openly and proudly defies the Reinheitsgebot, I always wonder if that bier is sold in Germany. I get the impression that, while pilsners by the Bitburgers and Krombachers still rule the roost, biers with fruit, very hoppy ales, etc. are slowly appearing on store shelves and on taps. The bier I'm reviewing today, Schneider Weisse's Tap X Cuvée Barrique, is a weizenbock aged in pinot noir barrels for eight months. While I gather that the bier was brewed in accordance with the infamous bier purity laws I have no idea if aging in a wine barrel leaves the finished product Reinheitsgebot-compliant or not. Even if it isn't, I'd imagine that Schneider Weisse brewmaster Hans-Peter Drexler has managed to profoundly irritate many of his fellow Bavarians who think that this bier violates the Reinheitsgebot in spirit, if not in practice. Schneider Weisse brews – what else? - weissbiers and is best-known, here in the States, anyway, for its Aventinus, a weizenbock, and Aventius Weizen-Eisbock. These are generally considered to be world-class biers. I don't know if Drexler saw the writing on the wall or is merely a curious fellow, but he has taken Schneider Weisse on jaunts away from tradition. For example, there's Hopfenweisse, an extra hoppy weissbier that was the result of a collaboration between Drexler and Garrett Oliver of Brooklyn Brewery. The Tap X series, which appears to be an annual release, takes things out into left field. The first entry back in 2011 was a weissbier brewed with Belgian yeast and Nelson Sauvin hops, a variety from New Zealand. 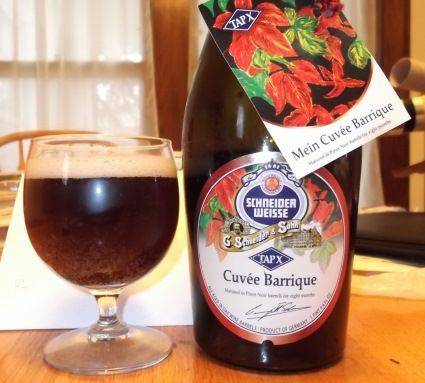 The following year came this brew, Cuvée Barrique, which is a blend of Aventinus and Aventinus Weizen-Eisbock which was "matured" in pinot noir barrels for eight months. Mein Cuvée Barrique pours a deep brown with red highlights which I guess makes it chestnut. I was rather surprised that the bier was clear. Perhaps I shouldn't have been but I figured weizenbocks are hazy and sitting in a wine barrel must surely leave behind grape must detritus or tannin scree or some such thing, right? My pour produced a moderately sized head that was tan and lasted a little while. Due to the dark color, I wasn't able to see inside the glass and collapse the wave form so the bier was both effervescent and still at the same time. Have you ever smelled a beer, read a description of that beer's smell by someone whose nose caught a totally different set of aromas than yours, and then sniffed the beer again only to find that you're now smelling what that other person did? I hate it when that happens so I purposefully avoided reading the little card that came draped around the bottle's neck until I was done drinking it. That card says that Mein Cuvée Barrique smells like "fighs [sic] and dried pears." Since I haven't taken a whiff of figs in years and don’t recall ever having come across dried pears, I can only imagine how my brain would have dealt with this cognitive dissonance. As it was, I thought the bier had an aroma of sour cherries and plum. It was all stone fruits for me – no pomaceous ones. The tag said my tongue would meet "cherries, balanced by a hint of vanilla and chocolate and a pleasantly sour and liquorice taste." I definitely caught the cherry and that hint of chocolate. Vanilla, not so much. There was a little bite of fizziness from the carbonation along with a little tartness. I did not catch liquorice but I did get some clove. One of the great beer tasting conundrums for me is why I taste vermouth in certain beers. I tasted it here but didn't find it surprising as vermouth is fortified wine. The bier had a medium body and was very smooth. For the finish the cherry and vermouth flavors were joined by a little boozy heat and some tannin dryness. There was no Schaumhaftvermoegen to be had as all of it slid down into the bier. To be honest, I was surprised at how much I enjoyed Mein Cuvée Barrique. I don’t mean to damn Schneider Weisse with faint praise, it's just that I am not a wine drinker. I'll have a glass of Riesling every once in a while but red wine is verboten. That stuff is too dry; it's like drinking chalk. In addition, I couldn't taste much weizen here beyond some clove so the emphasis was firmly on the vinous flavors. But I still enjoyed the rich, tart fruitiness bedecked with some spice and accented with just enough tannin dryness for a nice contrast. I think the bier's medium body and smooth mouthfeel also helped differentiate it from wine in my head. Junk food pairing: Pair Mein Cuvée Barrique with some of Herr's Kansas City Prime Steak Flavor potato chips and/or dark chocolate covered pretzels. 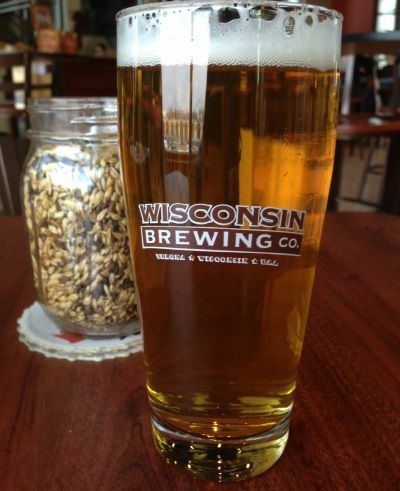 Last weekend the frau and I took a trek out to Verona and visited Wisconsin Brewing Company. We did so as an act of nostalgia, to recall the days when Kirby Nelson was not a hophead and was instead someone who reveled in being the brewmaster at a "Wisconsin lager brewery". Well, that and I had two free brewery tour passes each of which came replete with a free pint. And Verona was on our way home from New Glarus so we'd be in the neighborhood anyway. As someone who began drinking Kirby's beers over a quarter century ago, it is genuinely odd to be at WBC and see the beer menu. Moving past the paucity of lagers, there are the hoppy brews. Various IPAs, most of which have "HOP" in big, bold letters in the name, would surely have been anathema to Kirby not all that long ago. And his helles bock is dry-hopped. And then there are the Belgian-style brews. Anyone remember Prairie Gold or the experimental beer Kirby made which was basically Island Wheat brewed with a Belgian yeast? Back In 2010 anyone who proclaimed that he'd be brewing Belgian-style beers in 2016 - and ones that weren't bad at that – would have been spirited away in the night and committed to Mendota. Our tour was conducted by a lovely young woman named Athena which is a wonderful name. (I wonder if her parents were classicists and teased her as a child by telling her that she popped out of her father's head.) She was quite friendly and knowledgeable about the brewhouse and what laid therein despite not being a brewer. Sacks of red wheat seemed to be scattered around the entire brewhouse. Presumably they'll be brewing S'Wheat Caroline anon. The cooler held some interesting sights. First there was a pallet of six carbuoys filled with proto-beers destined for Madison Craft Beer Week. There was little indication as to what styles they were but the carbuoys had labels with hop names on them – Saaz, Citra, Waimea, et al. And in the corner was a rack of whiskey barrels filled with Depth Charge scotch ale just aging away. Before the tour we indulged in some breakfast brews. The frau got a flight while I had a pint of WBC's latest brew, Nectarine, a Special Pale Ale. I had noticed that it was billed as "Fauerbach's Nectarine" and asked Athena about this. She told me that the former Madison brewery (it closed in 1966) had a low-alcohol "hop and malt tonic" back in the day that was even marketed to pregnant women. The beer had nothing to do with the tonic beyond the name which was a tribute to local brewing history. Nectarine pours a lovely light gold color. It's clear so I could see a smattering of bubbles in it heading up to a nice crown of white foam that lasted for a fair amount of time. Long enough, anyway, for me to actually get a photo of it. It was still morning when we ordered our beers so the big citrus aroma of Nectarine seemed highly appropriate. I presume the grapefruit-like scent came from the Cascade and unnamed experimental hops while the orange came from the orange peel. I also caught a hint of grass in there too which I really liked as it contrasted with the citrus. As with the aroma, so the taste. The hops really came through in the taste with grapefruit/citrus first followed by some floral flavor and even a bit of the grass. And the orange peel added to citrus madness as well. It became more prominent as the beer warmed lending a slight sweetness. Right out of the tap I couldn't taste much malt but, as with the orange peel, I began to taste a little malt sweetness as the brew warmed. Despite the name, the addition of orange peel, and the use of honey malt, Nectarine is not a sweet beer. I'm not familiar with honey malt but, from what I gather, it's a very sweet malt that gives beer a golden color. Presumably just a bit o' honey malt was used here. The beer finished with a moderate bitterness as the fruity hop flavor faded to reveal more grassy hop taste. There were large patches of lacing all around my glass. Nectarine is all about the hops. Well, and orange peel, to be fair. Citrus dominates both the aroma and taste. The beer has a light body and a clean, almost maltless, flavor which allowed the hops to shine. Having said this, Nectarine isn't a very bitter beer; it just has plenty of hop flavor. It's 4.9% A.B.V. and will no doubt be a fine summer sipper for many folks. Personally, one pint was enough for me. Not unlike Supper Club, Nectarine's not bad but comes across as being one dimensional and, of course, that dimension is trendy, West Coast hops. I wish it had more maltiness, more grassy hops flavor, or even just more fizziness. Just something to provide a little contrast to the citrus. Junk food pairing: Pair your Nectarine with a bag of Doritios Dinamita Chile Limón tortilla chips. Sure, it adds to the citrus onslaught but the salt and chili are complementary and help bring out the malt a touch. 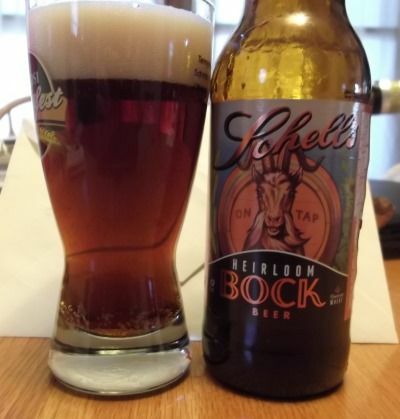 Sure to Please Beer and Goat Lovers Alike: Heirloom Bock by August Schell Brewing Co.
Spring is now upon us and there is no shortage of bocks in the stores these days. Back in January Schell Brewing next door in Minnesota released a bock sampler 12-pack which was sure to please both beer and goat lovers alike. The only place in Madison that I saw the packs was at Woodman's on the west side. I was quite happy to find it as I was disappointed that New Glarus had decided not to brew Cabin Fever this spring and I believe that they skipped over Back 40 last year too. Legend has it that "bock" is a Bavarian corruption of Einbeck, a northern German city which developed a reputation for brewing fine biers back in the High Middle Ages that were dark and strong. Moving ahead a few hundred years to the Renaissance, Bavarian brewers in Munich were busying themselves with adopting the style. Eventually the southern brewers adapted the traditional bockbier to trendy new lagering techniques producing the bock that we know and enjoy today. Bock is what Germans call a starkbier or strong beer. I'm not sure if this more of a brewing term or more of a taxing term. My understanding is that bier was taxed (is?) in Germany by strength. Regardless, bocks are generally 6-7% A.B.V. and there are stronger doppelbocks (these are where fasting monks come in) and even more potent eisbocks. I can't find anything indicating what the proto-bock brewed back when von Eschenbach was writing Parzival tasted like but the modern bock is a bastion of malty goodness with varying levels of hoppiness, depending on the type of bock you're drinking. Generally speaking, lighter-colored maibocks are hoppier than their darker cousins that abound in the depths of winter. And, also generally speaking, American brewers seem quite keen on making any kind of bock quite hoppy with plenty of New World greens. Schell's 12-pronged celebration of winter includes four different bocks: their current bock available as a winter seasonal, a doppelbock, a bock made with from a pre-Prohibition formula, and Heirloom Bock that is brewed with wheat and spelt, which is also wheat. A few German brewers still brew dinkelbier with dinkel being an heirloom variety of spelt so this is yet another instance of Schell's "German craft beer" mantra in action. I began with the Heirloom Bock for no particular reason and it poured a lovely deep amber color that was crystal clear. It was topped with about a goodly sized head of frothy tan foam that proved in no hurry to go anywhere. There were plenty of bubbles inside the glass going upwards. The aroma was a nice mix of malty scents along with a small dose of hops. Sweeter smells came first with a bit of caramel followed by plum. Roasted grains came next. And buried in there amongst the wheat, the other wheat, and the barley was a dash of grassy hop. What I discovered was that the bier tasted a lot like it smelled. There was a bit of caramel along with roasted grain and – quelle surprise – wheat. I also tasted a slight sweetness that wasn't like caramel or toffee but also not fruity. Just a grainy sweetness. This bier had a nice smooth, medium body. It just felt good on the tongue. A hint of carbonation helped keep the sweetness in line with the more savory malt flavors. For the finish, the hops stepped up with a grassy flavor accented by a little spiciness. They were moderately bitter and lent some dryness as well. My glass was left with some large sheets of Schaumhaftvermoegen. Wheat beers are always some of the prettiest. Heirloom Bock is awash in malt flavors but the sweetness is kept at bay. Instead gentle waves of grainy goodness wash over your tongue. This is not to say that it is thin or watery – it isn't – but it's also not chewy. You know how Led Zeppelin was "tight but loose"? Heirloom Bock is full-bodied but nimble. Junk food pairing: Grab a bag of Kettle Brand Cheddar Beer potato chips to go along with your Heirloom bock. In addition to being meta, they're tasty. As I wrote last month, my brother's death has spurred me on to learn more about World War II, a favorite subject of his and of our father, who is also gone. It's like keeping a family legacy going. While I wrote about Douglas Porch's A Path to Victory first, it was Savage Continent that I read first. And so I belatedly present some thoughts on the latter. The boys came home, went to school on the G.I. Bill, and then got homes and jobs in the suburbs. While there is certainly some truth to this highly rosy scenario, the situation was much more complicated. American World War II veterans did have what we now call Post Traumatic Stress Disorder but it was most often something that was not talked about and men kept their feelings bottled up inside. Many American vets certainly went through hell. But they came home to heaven, in contrast to the people of Europe. 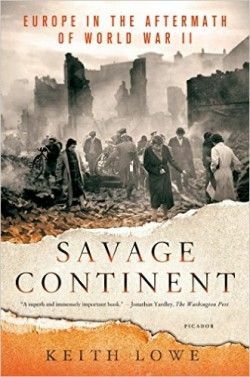 In Savage Continent, Keith Lowe examines the cimmerian world that was Europe in the years following the end of World War II. In his introduction he asks the 21st century reader to use her imagination and contemplate a world without social institutions; one where there are no stores and no businesses - money is worthless; a world without police, judges, jails, etc. No law and order. "There is no shame. There is no morality. There is only survival." Lowe begins by looking at the physical destruction. Warsaw is his first example. It was a city of nearly 1.4 million people in 1939. By the war's end about two-thirds of those people were lost. Lowe says that the Germans systematically destroyed the city and, when they were through, 93% of Warsaw's dwellings were destroyed or left uninhabitable. Here are some photos. Sensationelles Filmmaterial! Berlin nach der Apokalypse in Farbe und HD - Berlin In July 1945 (HD 1080p) from Konstantin von zur Mühlen on Vimeo. Beyond the destruction of buildings, there was the toll on human life. Some 35-40 million people died as a direct result of the war with some 6 million of those being Jews. Lowe concedes the difficulty in appreciating such vast numbers and so he includes the words of survivors to put the numbers into a more manageable perspective. For instance, there is the testimony of Alice Adams originally from Drohobycz, Poland. "...the whole population of Drohobycz was wiped out, about thirty thousand people, they were all shot...I watched somebody being killed every day – that was part of my childhood." Europe was awash with widows and, with many children having lost at least one parent, kids were often found in packs wandering the streets like feral dogs. Hunger was rampant. Some 16,000-20,000 Dutch died of starvation while that number jumps to a quarter of a million in Greece. But Eastern Europe had it worst. Indeed, it seems that almost every infernal scheme the Nazis had was worse for Slavs. Much of the hunger in Western Europe was the result of Hitler simply giving preference to Germans, but in the East the Nazis were keen on starving Slavs to death out of spite and millions died. Lowe devotes roughly a quarter of his book to vengeance. In countries throughout Europe people who collaborated with the Nazis were punished. Some were merely made to suffer opprobrium while others were given minor punishments such as the loss of voting rights. But harsher punishments were handed out both by reconstituted courts and by extrajudicial justice seekers. Collaborators were sometimes given the death penalty by judges while vigilantes meted out justice in the form of beatings and murder. And of course Germans were at the receiving end of the vengeful as well. For example, Allied soldiers often looked the other way so that concentration camp survivors could take revenge on their former jailers. Unsurprisingly, just being German was enough to incur someone's wrath. Innocent German civilians were often shown little mercy by their former neighbors and none whatsoever by the Russians moving ever westward. Women from occupied countries who had consorted with Germans suffered at the hands of their own people. I was reminded of the tragic story of Izabel Laxamana, a 13 year-old girls who killed herself after her father punished her by cutting off most of her hair. Amanda Hess denounced the punishment as being "medieval" over at Slate. But as Lowe shows, women from all parts of Europe who had relationships with members of occupying German forces had their heads shaved. 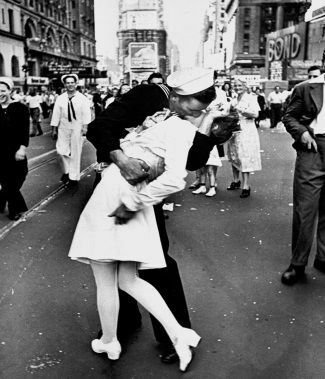 Often times this was done in a town square or other public space where the women were stripped naked (by men, of course) and had swastikas painted on them in addition to being shorn. Children from these unions were frequently shunned and written off as being evil Germans despite their mothers' heritage. The sheer destruction of life and property was depressing. Add on to that the petty acts of vengeance and the situation is even more bleak. But it was really the book's third section on ethnic cleansing that almost sent me into the depths of perdition. Since the concentration camps were located in eastern Europe, many people in the west were unaware of just what had happened. Jews returning home to Holland were often greeted with such sentiments as "You're lucky you weren't here. We suffered such hunger!" and "You have a roof over your head and food the whole time!" But insensitivity was the least of all worries. Having survived the Holocaust, European Jews found that their tribulations were not yet over. The section called "The Jewish Flight" tells the tale of a Polish Jew named Roman Halter. He survived the death camps and was liberated by the Russians. On his trek back to Poland to search for his family, Halter encounters a Russian soldier who treats him no better than the Germans. The soldier "took out his revolver from his holster, pointed at my head and pulled the trigger. There was a loud click." Jews returning to their homes often encountered resistance when trying to reclaim their property. The book has one of the darkest examples of black humor in the form of a joke. A Jew returns home to Budapest having survived the Holocaust. He encounters a Christian friend who asks how he's doing. The Jew replies, "Don't even ask. I have returned from the camp and now I have nothing except the clothes you are wearing." In Kunmadaras, Hungary, tensions and anti-Semitism came to head when blood libel was invoked to attack an egg vendor. A mob would go on to surround the man's house and kill him before seeking vengeance on other Jews in a mini-pogrom. Polish-Ukrainian hatred gets a section of its own. With German power declining, Ukrainians took to partisan groups such as the Ukrainian Insurgent Army and set out against Poles. In 1943-44 hundreds of Polish villages were beset by the thirst blood of such groups. Buildings were burned and some villages razed entirely while victims were beheaded and/or disemboweled. The tables turned after the war illustrated by the fate of a village in Poland called Zawadka Morochowska which was inhabited by Ukrainians. The Polish army arrived in January 1946 and began a massacre. Dozens of villagers were murdered with some having been disemboweled or set on fire. Savage Continent does a remarkable job of describing the pandemonium of post-war Europe. Going in I tended to think of the time following the German surrender as being filled with people wandering urban ruins, the Marshall Plan, and the raising of the Iron Curtain. Upon finishing the book I felt a bit numb contemplating what the darker sides of our nature can accomplish. Lowe writes for the layreader here and the text includes plenty of photos portraying the chaos and destruction in graphic detail. Lowe sets for himself some goals in the book's introduction. As a non-historian who has never read anything on this subject previously, I really don't know about the paucity of histories of the immediate postwar period and how Savage Continent fits into the larger study of this time. But he accomplished his goal of dedicating an ample number of pages to eastern Europe instead of focusing on the western half as, he says, most scholarship on the subject does. Lowe also mentions that he attempted to sort through the varying statistics in an even-handed manner. There are multiple times in the book in which he weighs differing stats and I felt he adjudicated fairly. While I learned quite a bit from Savage Continent, there was one section which came across as pop psychology to me. In "The Shearing of Women", Lowe claims that "On the whole, European women slept with Germans not because they were forced to, or because their own men were absent, or because they needed money or food – but simply because they found the strong, 'knightly' image of the German soldiers intensely attractive". He proceeds to opine that French men were emasculated by the Germans and that they really began to shed the effeminate taint as the French and the Allies set out to liberate France. While I'd have to check out Lowe's source materials (and this book is well-researched), this section stood out for me because it felt like it had left history and statistics behind for baseless Freudian theorizing. Lowe ends the book with a plea for truth and historical accuracy to prevail over falsehoods and national mythmaking, things which divide and can be used to incite hatred or worse. It was refreshing to read an historian talk about and give examples to illustrate why his profession and his area of study are important and what they can give to non-historians. Lowe writes, "It is not our remembering the sins of the past that provokes hatred, but the way in which we remember them." There is much to chew on here. Not only does it help explain how the Europe of today arose, but it also makes you ponder the future. For example, can ethnic hatreds that abated after the end of the Cold War reemerge? What can a fuller understanding of history do for us? When I first heard that one of my favorite breweries, Chicago's Metropolitan had collaborated with another Chicagoland purveyor of suds, Two Brothers Brewing, I was ambivalent. This is no slight against Two Brothers. I've only tasted one of their beers so I am still very much developing my opinion of them. No, my bit of apprehension was due to the fruit of their collaboration, False Dichotomy, is an India Pale Lager. What exactly constitutes an IPL is debatable. It's whatever the brewer labels as such. Still, I tend to think of the style as being a lager whose primary hop flavor or flavors are not those of Noble hops, i.e. - the hops have the taste of fruits and flowers. Perhaps my apprehension is completely irrational as I've consumed IPLs before and they were plenty fine. But I just can't help but shudder when I see the word "India" on beer label. It's a Pavlovian thing. It's a dislike of trendiness thing. I fear that I'll see Metro's brewmaster Doug Hurst dressed like he's in Ultravox courting the ironically mustachioed outside 1871 with his new India Pale Dunkel called USB Charger that is dry hopped with nameless experimental hops that smell like corpse flowers and taste like guava Jolly Ranchers. I trust that his co-proprietor Tracy Hurst would put the kibosh on such a thing should this nightmare scenario ever come close to fruition. Despite all this, I went out and bought a six pack when the bier was released earlier this month. False Dichotomy, contrary to my photograph, pours a nice yellow – much lighter than my poor picture suggests. It was nice and clear with a big crown of soft, white foam. There were bubbles aplenty inside making their way up my glass. If the bier looked like your typical pilsner, then the first sign that all was not as it appeared came in the aroma. Not knowing what hops were used I was surprised to smell some very spicy/grassy hops along with a touch of honeyed sweetness. Nothing out of the ordinary so far. That is until I noticed a rather floral hop scent that reminded me of Amarillos in its sweetness. So Two Brothers and Metro had opted to not give us something from way out in left field; there was still some Central European tradition to be found in the bier which perhaps explains its name. I noticed that honey-like malt sweetness on my tongue first. False Dichotomy is 7.2% A.B.V. so it's hardly surprising that the grains assert themselves. Being a lager, it has a clean flavor which lets not only the malts but also what must be an arsenal of hops compete for the drinker's attention. Initially it was that floral thing from the nose that hit me. Not overpowering but distinctive. Then further in the background was a mellow fruity/melon-like hop taste. This, presumably, came from the German Huell Melon hops, a rather new variety. Towards the end the hop flavor changed again into something more traditional – a Noble peppery taste. Amidst all this was a modicum of carbonation. False Dichotomy finished with the peppery/spicy hoppiness developing into a bitter vortex of dryness, tasting a lot like a Czech pilsner. As I'd expect from a pils, my glass was left with some great Schaumhaftvermoegen with big streaks all around. 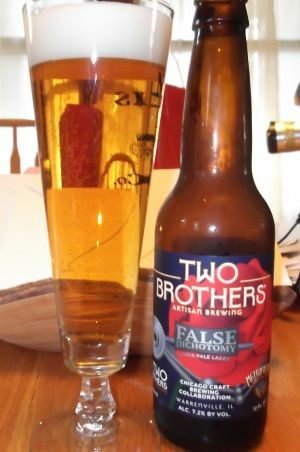 False Dichotomy is a fairly big bier being 7.2% A.B.V. but it's medium-light body makes it drink easier than similar brews appellated with another dreaded I-word – imperial. The bier really takes you for a ride with its hops. Noble hop flavors sit astride nouveau Central European ones. All things considered, False Dichotomy isn't that bitter a bier. While it is hoppy all the way through, it doesn't get bitter until the end. And I really appreciated that the malt was always there no matter where I was on the hop roller coaster. Despite the many good things about this bier, I remain ambivalent about it. I'm undecided about the strong, bitter spicy hops next to the mellow melon ones. Individually these flavors are quite tasty but next to and melding into one another, well, I'm just not sold on the idea. I drank most of a six pack trying to decide – and believe me, I did not have to be restrained and have the bier poured down my throat - yet remain on the fence. Junk food pairing: try some jalapeno popper stuffed pretzel bites with your False Dichotomy. Just as the bier blends the New and Old Worlds so do these pretzels with traditional Bavarian pretzel goodness surrounding a tender center of spicy cheese gluttony. Hello Daddy, Hello Mom: Black Forest Cherry by August Schell Brewing Co. The fourth Noble Star Berliner Weisse is Black Forest Cherry. Just as Framboise Du Nord used 5,000 pounds of raspberries, so does this one use 5,000 pounds of the eponymous fruit. 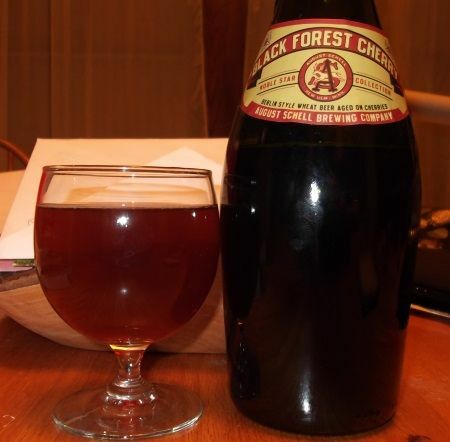 And just like I did with Framboise Du Nord, I thought of a New Glarus beer as I opened my Black Forest Cherry – Belgian Red. Two sour cherry beers, sure, but two rather different beers nonetheless. A Schell's press release said the inspiration for this bier was the old German tradition of putting some cherry liquor into a Berliner Weisse. (I think they may have meant liqueur but that's not a big issue.) I'd never heard of this practice (no surprise there) and thought that the addition of cherry was simply to produce another bier flavored with traditional German fruits as opposed to kumquats or other tropical ones. On the other had, I wasn't surprised. I've read of Germans putting caraway flavored liquor into their bier (perhaps Schell will brew a caraway Noble Star) as well as northern Germans drinking bier with a shot of Korn which is basically vodka made from rye. As the fourth release we've come to the summer of 2014, about a year after the first Noble Star. My bottle was filled in July 2014. Black Forest Cherry pours an auburn hue with a little extra red in there. Unlike the last Noble Star, this bier was downright hazy. Again I was unable to generate any more than a small tan head that dissipated quickly. As expected, there were plenty of bubbles inside the bier moving on up. I recently read a wine review in which the author claimed that a particular vino smelled like smoked quartz and slate to her. I'd never encountered such a fusion of olfactory prowess and geology previously. In addition there was washed rind cheese, fennel or perhaps celery, tarragon, apple, and white flowers. All of this in a single wine – and that's just the aroma. This Sokal-eque review comes to mind because, when I took a sniff of my Black Forest Cherry, I didn't get a laundry list of aromas. Just two, in fact – lemony lacto and tart cherry. Regardless, it smelled wonderful despite lacking any igneous, sedimentary, or metamorphic scents. My previous Noble Star went easy on the carbonation but that was not the case here. Black Forest Cherry is quite fizzy. The lactic acid sourness was big and bright and complemented well by the more blunt tartness of the cherries. In addition to their tartness, the cherries themselves were quite tasty with their almondy-clovey taste providing a nice counterpoint to the citrus flavor of the lactic acid. There was a mild woodiness from the aging tanks here too which went really nicely with the stone fruit. Black Forest Cherry finished with the lactic sour and cherry tart lingering on the tongue. Despite being rather tart and sour, the bier didn't come across as being very acidulous. Perhaps this is because of the large dose of cherry. My glass was left ohne Schaumhaftvermoegen. What a lovely bier. It was dry overall with a goodly amount of sour and tart. I really enjoyed how the bacteria and fruit came together here. Again Schell has brewed a bier that isn't too anything – they really know how to give your tongue a good dose of sour without going overboard and how to add fruit without having it smother the bier. This is Jace Marti and company in the zone, at the top of their game, and whatever other sports phrase trips your trigger. Junk food pairing: Wash down a Hostess Cherry Pie with your Black Forest Cherry. For a savory treat, grab a handful of Kettle Maple Bacon potato chips. Please See If Her Green Neck Is Long: North Country Brünette by August Schell Brewing Co. While I cannot recall exactly when and where I was introduced to the Berliner Weisse, it was certainly presented as a light, fizzy, sour wheat bier. A Berliner Weisse was yellow and somewhere from 3-4% A.B.V. or so the stylistic piety went. However, back in Germany in the 19th century you'd find breweries making them to various strengths including Märzen which was about 5.5%. I'd never heard of such a thing until a couple years ago when Schell introduced the third in its Noble Star series of Berliner Weisses, North Country Brünette. As the name implies, the bier is not a bright, hazy yellow and it is 5.4% A.B.V. instead of 3.7% as the first couple Noble Stars were. My bottle was filled in March of 2014. I've had good luck with aging Berliner Weisses, intentional or not. I won't claim letting one sit in your basement for a couple years will yield a bier superior to one uncorked fresh from the store soon after release, but I've never been assaulted by bad flavors. 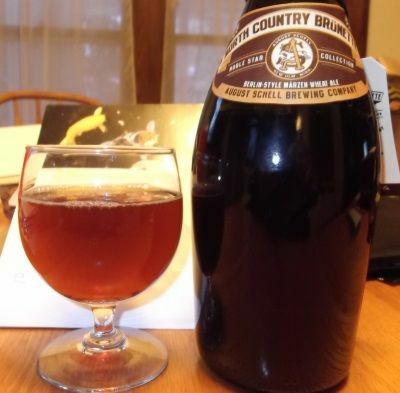 North Country Brünette pours a fairly dark auburn. It appeared to be clear which I took as a sign that there's less wheat in this bier. Maybe I need to learn to pour but I never seem to get a big head with these Noble Star brews. Here I got a small one that was off-white and, just like others, dissipated rather quickly. However, there was plenty of bubbles inside the bier going up the glass. Taking a whiff, I got the usual lemony/citrusy lactic acid smell along with some subtle barnyard brettanomyces funk and some even more subtle hints of leather and perhaps cherry. I think the latter two scents were from the malt. Never having had a Märzen Berliner Weisse, I wasn't sure exactly what was typical for the aroma. Add to that the bier's age and I was clearly in terra incognita. Well, for me, anyway. An insistent lemony lacto sour was first in the taste and its potency didn't diminish very much as I went along. Schell has, for my taste, really hit the sweet spot as far as making the Noble Stars sour. So far they've had a consistent level of sourness which is perfect for me. The Noble Star biers are aged in reconditioned cypress lagering tanks and I could really taste that here. It seems that the woody flavor gets lost when there's fruit involved. There was also a little brett funk which grew as the bier warmed. North Country Brünette tasted less fizzy than previous Noble Stars but I suspect that's due to its slightly heavier body. I couldn't taste anything typically malty, if you will. The heavier body betrayed more grain but I didn't discern any caramel or roasted grain flavors. I thought it tasted fairly dry but not particularly acidic. The bier also had vinous flavor to it which reminded me of vermouth. I highly suspect this to be an off flavor due to age but it wasn't an unpleasant one as it went well with the woody notes. North Country Brünette finished dry with some lingering lactic sourness and a touch of brett. Not a trace of Schaumhaftvermoegen. This was quite a departure from the Berliner Weisse that I was used to and was akin to a sour brown ale. By the time I got to the bottom of the bottle I was tasting a lot more funk than I did in my first glass but still not a great amount. Schell hit another sweet spot for me. Moving away from light and light & fruity, North Country Brünette is replete with darker, earthier flavors than the previous Noble Stars I've had. I could have done with a bit less woody flavor but this is a minor quibble. As the third release in the series, it's a great diversion out into left field. Junk food pairing: North Country Brünette goes well with blue cheese. Sadly, we are going to have to wait for the day when junk food makers will offer something that lets blue cheese stand alone instead of the mandatory mingling with Buffalo wing sauce dust. Until then try some Doritos Collisions Hot Wings and Blue Cheese where you can segregate the blue cheese chips from the spicy ones. She drank a raspberry Berliner Weisse: Framboise Du Nord by August Schell Brewing Co.
Today I am going continue drinking my way through the Noble Star series of Berliner Weisses from Minnesota's venerable Schell Brewery. I began with Apparent Horizon the latest in the series as I type. Framboise Du Nord or "Raspberry of the North", is the second in the series but I'm getting all timey-wimey so it is next on the docket. My bottle was filled back in October 2013 and I am hoping it survived the past couple years in my cellar more or less intact. Framboise Du Nord is 3.7% A.B.V. which I believe was the same strength as the initial brew in the series, a plain Berliner Weisse, and now considered average for the style although the bier has been historically brewed to a variety of strengths. The use of raspberries is an inspired choice. Not only are they very tasty but they are also one of the two common flavors of syrup traditionally put into Berliner Weisse with the other being woodruff. Schell boasts that 5,000 pounds of raspberries were used while the bier aged in the heritage cypress lagering tanks for a few months. 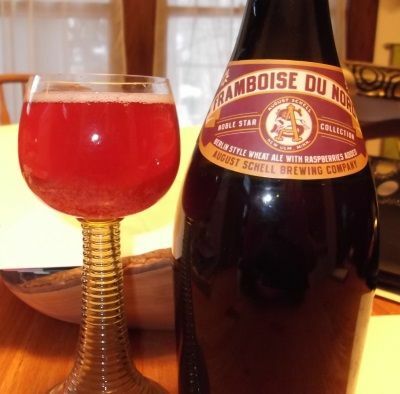 Framboise Du Nord comes in a lovely, well, raspberry red that has a slight brown tint to it. It was just a touch hazy. My initial pour produced a rather small pink head that went away quite quickly. As befitting a "champagne of the north", however, there were lots of bubbles in the bier making their way up. As I was trying to take a decent enough photograph for this post I could smell the raspberries. Framboise Du Nord positively emanated clouds of fresh raspberry goodness. Underneath this was the expected lemony lacto tartness. The bier smelled like summer in a glass – it was absolutely wonderful. For better or for worse, I've developed a habit of holding my first sip in my mouth so that it sits on my tongue as well as keeps at least part of the roof of my mouth covered. I think this really brings out the carbonation and made the first sip of Framboise Du Nord a big, bubbly, tart, in-your-face fruity explosion. I could feel the carbonation tingle while that lemony lacto sour melded with the tartness from the raspberries. The fruit here tasted fresh and juicy despite the bier's age and the lacto sour did not let up very much as I worked my way through the bottle. As a Cheesehead it's difficult not to think of New Glarus' Raspberry Tart here. It too comes in a big green bottle, has a similar color to Framboise Du Nord, and they are both sour brews. But Raspberry Tart has a bit of sweetness that Framboise Du Nord does not. It's also a bit heavier than its neighbor from Minnesota too. Framboise Du Nord finishes with raspberry tartness and lactic acid sourness lingering long after the your sip has found its home in your belly. As per usual with the Berliner Weisse, there was no Schaumhaftvermoegen to be had. I drank this bier after coming in from shoveling snow and made fairly quick work of the bottle. Admittedly, there were a few sips that turned into thirst quenching gulps but I think I gave this bier a fair shot. And I loved it. It was light, fizzy, and bursted with the taste and smell of fresh raspberry. Plus it had a great mix of berry tartness and lacto sour which was big yet not overwhelming. It was dry and acidic but, again, not to an extreme. As it warmed, the bier revealed a little bit of that rode hard and put away wet brett funk but it accented rather than dominated the flavor. Junk food pairing: If you have some Framboise Du Nord squirreled away, I recommend busting it open and eating some Crunchy Flamin' Hot Limón Cheetos. Chicago's Goose Island is one of the elder statesmen of craft brewing having opened back in 1988 as a brewpub. So the uproar when the brewery became a subsidiary of A-B InBev back in 2011 was hardly surprising. Some people vowed never to buy their beer again as Goose Island had "sold out" to the enemy, it had abandoned its hometown. As far as I can tell today, very few people care about who owns Goose Island as long as there is Bourbon County Stout to be had. Never having been a big consumer of GI's beer, I can't say whether their brews have gotten worse since the sellout but I've heard commentary that beers no longer brewed in Chicago just don't taste as good, such as 312. On the other hand, the consensus is that the Bourbon County line remains top-notch. And so, while I'm strictly unqualified to judge whether GI's beers have gotten better or worse since becoming a subsidiary of a Belgian mega-corporation, I am going to judge the latest release in their Fulton & Wood series. Fulton & Wood beers are experiments. They are chances for GI folks to flex their creative muscles. From what I can tell the series began back in 2012 and has evolved into an exercise for everyone in the company. What may have begun as a chance for brewers to get away from the IPA routine has become something involving accountants, marketing people, and so on in addition to brewers. A bit like Lakefront's My Turn series, I suppose, but more collaborative, perhaps. 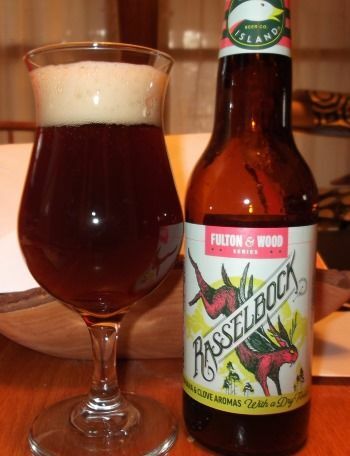 I recently purchased a six-pack of Rasselbock as the words "German style Dark, Rye, Wheat beer" caught my attention. Sehr interessant. A dunkel roggenbock, eh? I had to try it. While rasselbock sounds like a long-lost style of bier, it is, in fact, the name of the rabbit-like creature out of German (Bavarian?) folklore on the label with horns, wings, and fangs. It's the bearded Spock of jackalopes. I felt a bit like Benedict Arnold drinking this bier as I simply adore Vintage Brewing's Tippy Toboggan, the only other roggenbock of which I am aware. Tippy is one of my favorite biers of all-time so I am hoping that Vintage brewmaster Scott Manning never reads these words. My bottle was filled last month on the 19th so it was reasonably fresh when the bier made its way into my glass. Rasselbock pours a deep, dark chestnut. Maneuvering my glass as best I could, it appeared to be clear. I also spied a goodly number of bubbles inside making their way up to a firm, tan head that stuck around for a good, long time. The label didn't lie: the pungent aroma was full of banana as well as some clove. The yeast used here is from Weihenstephan, a Bavarian brewery known for its weissbiers. Rasselbock smells magnificent. Those phenolic/estery scents were prominent in the taste. Again, I found banana to be stronger with the clove in a more supporting role although clove moved towards the fore as the bier warmed. The carbonation added a touch of dryness as did the rye which added its usual tasty earthy/spiciness. I also tasted a little vanilla, just a smidgen of caramel sweetness, and a hint of roasted grain. For the finish Rasselbock cleaned itself up and allowed some spicy/grassy hop bitterness and flavor through to end things on a rather dry note. My glass was left with some nice Schaumhaftvermoegen as broad streaks lined most of the interior. As Darth Vader once said, impressive. The banana and clove flavors from the yeast are simply juicy and piquant yet allow plenty of room for the malty flavors, which range from earthy to sweet, to come through. Rasselbock uses Midnight Wheat which lends color to beer, but alas, it adds precious little roasted grain flavor, which I was hoping to taste. Can't have everything. The bier is 6.8% A.B.V. and has a medium body so it's got some heft yet it's not cloying or heavy. Junk food pairing: I find that roggenbiers go very well with pretzels, especially pumpernickel pretzels. If you can't find any, go with warm soft pretzels dipped in a sharp processed cheese food sauce.